On the day of Palmeiras’ 96th birthday, the home game against small fish Atlético-GO – currently holding last position in the League – was supposed to render 3 points and turn into a nice little present. Too bad nobody seemed to have informed Atlético about the plans, and much less Palmeiras’ players. If God is Brazilian, as often hinted at with tongue in cheek, he most certainly isn’t palmeirense. And what about our supporters, famous for a not very flattering tendency towards bipolarity? Well: considering last Thursday’s magnificent 3-0 win against Vitória and yesterday’s 0-3 against Atlético… If the team isn’t bipolar, then what the hell is it? There are a few hard questions needing straight answers at the moment. Palmeiras tried yet another formation – no. 8 since Scolari took over: Marcos; Vítor, Maurício Ramos, Danilo and Gabriel Silva (Patrik); Edinho, Tinga, Valdivia (Vinícius) and Rivaldo; Luan (Ewerthon) and Tadeu. With few creative options, the team depended heavily on Valdivia. He tried his best, but is visibly still lacking stamina and speed. Atlético marked Valdivia tightly and Palmeiras soon looked lost on the pitch, without purpose or a plan B. A couple of free kicks could have resulted in something, had Marcus Assunção not been absent due to his booking in Palmeiras’ last game against Guarani. Atlético played cleverly, biding its time, waiting for the right moments. A bright star shone for striker Elias, author of the team’s three goals. Watch the highlights below. When questioned about the difference between last Thursday’s game against Vitória and this one, Scolari said that none of them marked “my Palmeiras”, as there yet is no balance, no standard formula. In Scolari’s opinion, one need still to find a balance on and off the pitch, adjust training and tactics, among other things. 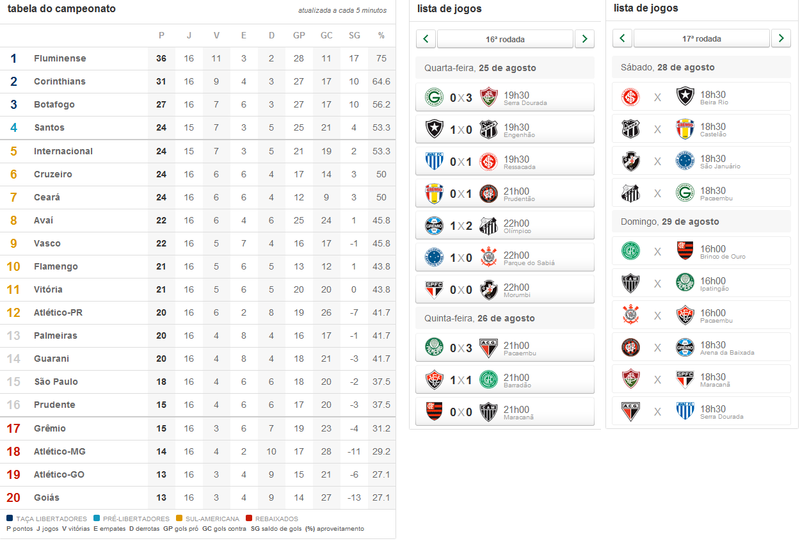 With yesterday’s result, Palmeiras dropped from 12th to 13th position, with a total of 20 points in 16 games (click thumbnail for full table and next round of games). This coming Sunday, Palmeiras heads to Belo Horizonte to face another bottom dwelling team, Atlético-MG, led by former Palmeiras and Real Madrid coach Vanderley Luxemburgo.